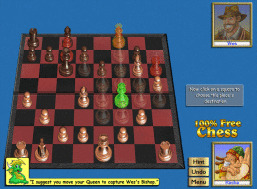 The King of All Chess Games! Discover a new set of friends with an exciting game of Championship Chess All-Stars! Our 24 realistic characters span across 5 levels of difficulty. Savvy Chess players will love challenging, while Checkers beginners get extra help with our personal in-game DreamCoach(TM). We'll go beyond just showing you what to play, we'll explain why you should play it. Version 7.30 supports Vista and Windows 7, adds new characters, improves artificial intelligence.